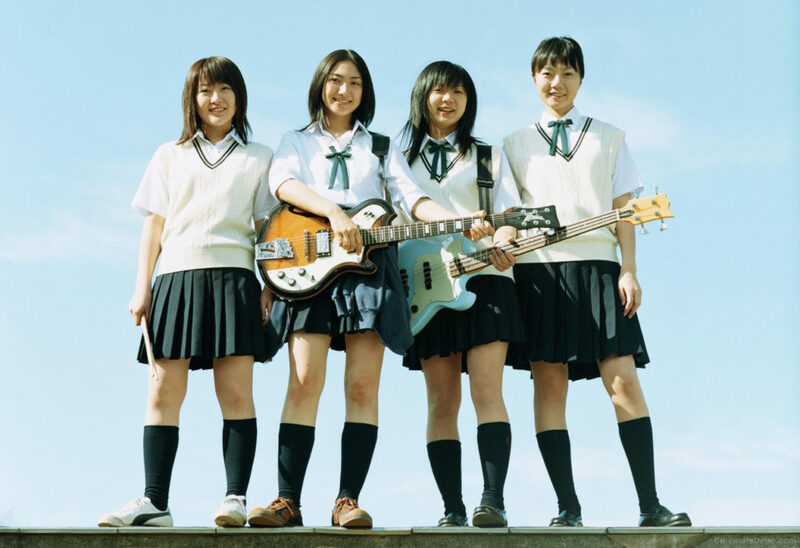 Three friends, Kyoko, Kei and Nozomi, decide, after problems with other members leaving, to keep their band together and perform at the closing concert of their high school cultural festival. Wanting a clean break from the songs they have performed before, they choose to cover The Blue Hearts, a popular punk band of the late eighties/ early nineties. The only problem is that they don’t have a lead singer. They recruit a Korean exchange student, Son, who they hope will be able to learn Japanese in time for their performance. The film focuses on the girls’ friendship with each other, as well as their relationships with friends and family. The plot of this film will be familiar if you have seen any films set in a high school: a group of friends practice for a final competition, or performance. This film almost seems to know that this plot is a cliché, and it never attempts to draw any drama from suggesting that they might not succeed, or that there are any problems to overcome (other than learning the songs). Instead the film takes almost a back seat as we watch their journey. Aided by great direction, which brings this above many similar movies in the genre, it always seems as though we are looking in on their lives. The romantic, if they could be called that, subplots, go nowhere, with one girl turning down her admirer, and another unable to confess her affection for a classmate. There are several scenes involving the girls’ families, or friends, which have no significance to the plot, or don’t reach any sort of resolution. Instead, the film seems to be giving us a snapshot of their lives. This might be frustrating for some, but I found that it made for an interesting film, rather than being an overly dramatised portrayal of high school life. The four lead actresses do a fantastic job, playing their different roles well, and are all likeable. Most of the humour derives from Bae Doona’s Son, who struggles with Japanese and Japanese culture, leading to many scenes of confusion (such as when she attempts to book out a Karaoke booth to practice singing, only to be told that you need to order a drink to be allowed to sing). The film does a good job of showing a realistic group of friends, with a lot of humour and great direction. The peculiar strength of the film is in its subtlety. While many films of this type would be trying hard to make you sympathise with the characters, using either an unexpected tragedy, or some serious issue, this film seems entirely unaware of your presence, offering only a candid look at the protagonists’ lives. Rather than making you feel distant, this instead makes you want to learn more about these characters, and cheer for them. The film leaves many things unsaid, again unusual in this genre, which usually ties up every subplot neatly. I would recommend this film to anyone who is a fan of this type of high-school film, as it does attempt to do things in a different way, has a lot of humour, and a great soundtrack ending with two fantastic renditions of Blue Hearts classics.